The Digital Research Library of Illinois History Journal™: White Fence Farm Restaurant on Route 66 in Romeoville, Illinois. White Fence Farm Restaurant on Route 66 in Romeoville, Illinois. 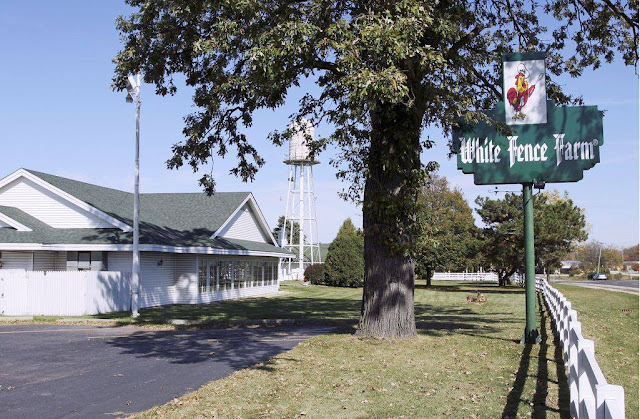 White Fence Farm is an original Illinois Route 66 Restaurant. ARTICLE "WHITE FENCE FARM CELEBRATES A 60-YEAR TRADITION" AT THE BOTTOM OF THE POST. The original White Fence Farm location is in Romeoville, where it was established in the early 1920s on US Route 66. It was founded by Stuyvesant 'Jack' Peabody, son of Peabody Coal Company founder Francis S. Peabody and himself CEO of Peabody Coal at the time. 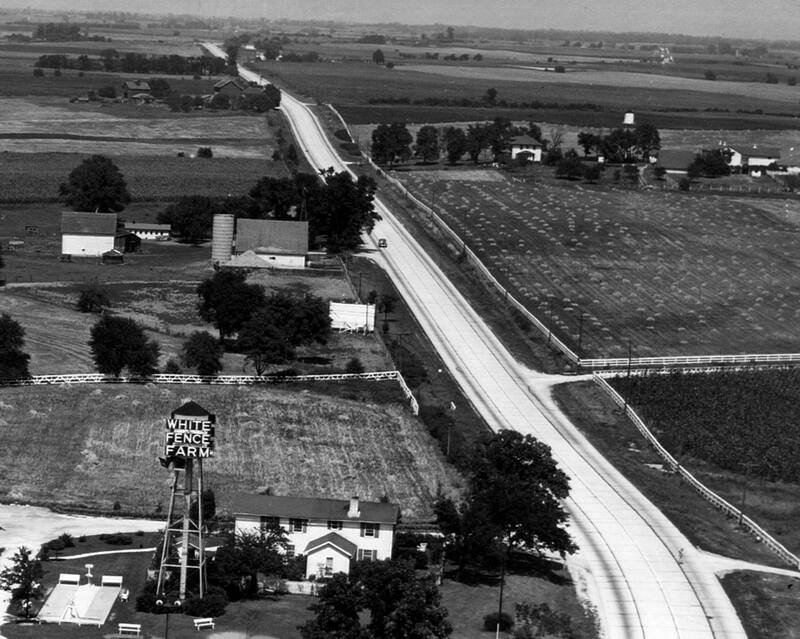 It was opened on a 12-acre plot that Jack Peabody owned across U.S. Route 66/Joliet Road from his 450-acre Lemont horse farm, where thoroughbred racehorses were bred, boarded and trained. 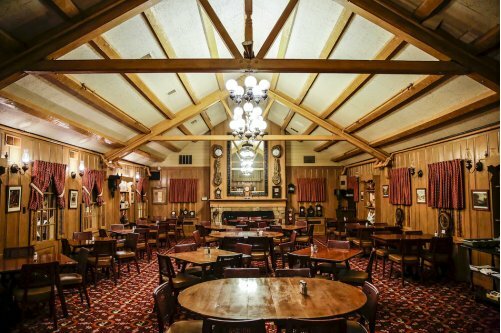 The original dining room at the White Fence Farm restaurant in Romeoville, Illinois. The story was that Jack Peabody often had weekend guests at his horse farm, but there was no restaurant in the area where he could entertain them – so he started one himself. The roadside restaurant, which opened in a converted farmhouse, was known then for its hamburger sandwiches and Guernsey milk products, including ice cream. 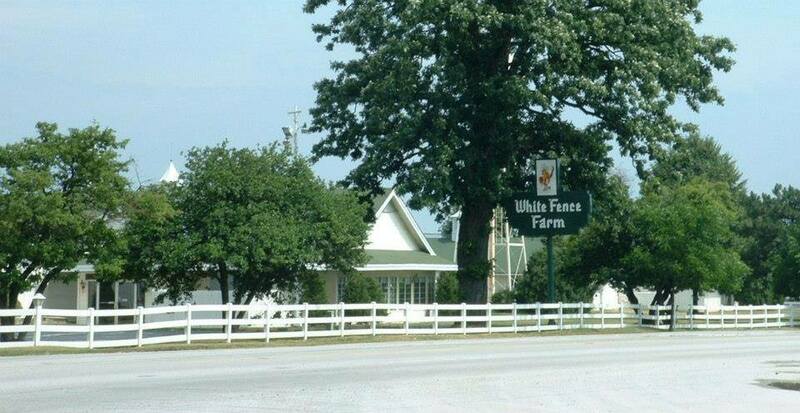 By the time U.S. Route 66 opened in November 1926, White Fence Farm had already served several thousand customers. It was reviewed several times during the Peabody years by the early restaurant critic Duncan Hines, who had been a fan of the restaurant since the late 1920s. After Prohibition ended, Jack Peabody promoted California wines at the restaurant and helped to revive the California wine industry, as he had earlier helped to revive thoroughbred horse racing in Illinois during the 1910s and 1920s. 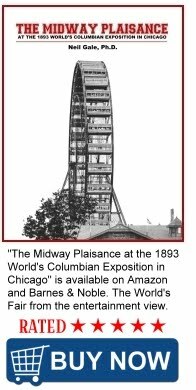 Peabody operated the restaurant successfully until his death in 1946. After that, the restaurant was first leased to several different renters, then eventually sold by Jack's son, Stuyvesant Peabody, Jr. Since 1954, the restaurant has been owned and operated by the Hastert family. Robert Hastert, Sr. was the first family owner-manager. Hastert had begun as a wholesale poultry dealer at the Aurora Poultry Market during World War II and later owned the Harmony House restaurant in Aurora, Illinois, which he had opened four years before he bought White Fence Farm. The property had gone through several operators and/or owners after being sold by the Peabody estate. Family legend has it that Bob Hastert, Sr. settled on the purchase price for the restaurant property with the previous owner, an acquaintance who had gone bankrupt, by using the flip of a coin. Hastert was uncle to and his son, Bob Hastert, Jr., was the first cousin of former Speaker of the House Rep. J. Dennis Hastert (R-IL). Bob Jr., who had converted an industrial-sized hospital autoclave into an outsized pressure cooker for the restaurant's unique method of cooking the chicken, took over the operation of the restaurant after his father's death in 1998. Bob Sr.'s wife, Doris, also worked at the restaurant, usually as a hostess. Laura Hastert-Gardner, daughter of Robert Jr., is the restaurant's current owner and manager. 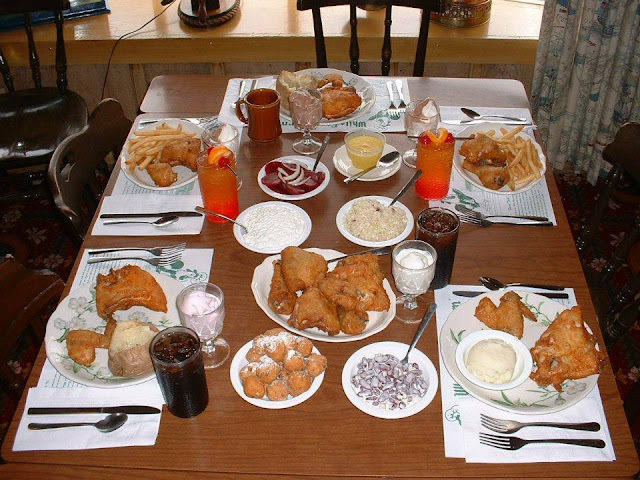 The restaurant's famous fried chicken recipe was added to the menu during the 1950s by Bob Hastert, Sr., who, by his granddaughter's admission, told the chicken recipe origin story several different ways at different times and may have just as easily borrowed the recipe from someone else as brought it with him from Harmony House. The restaurant building was expanded several times under the Hasterts. It now has several dining rooms, with seating for more than 1,000 customers. 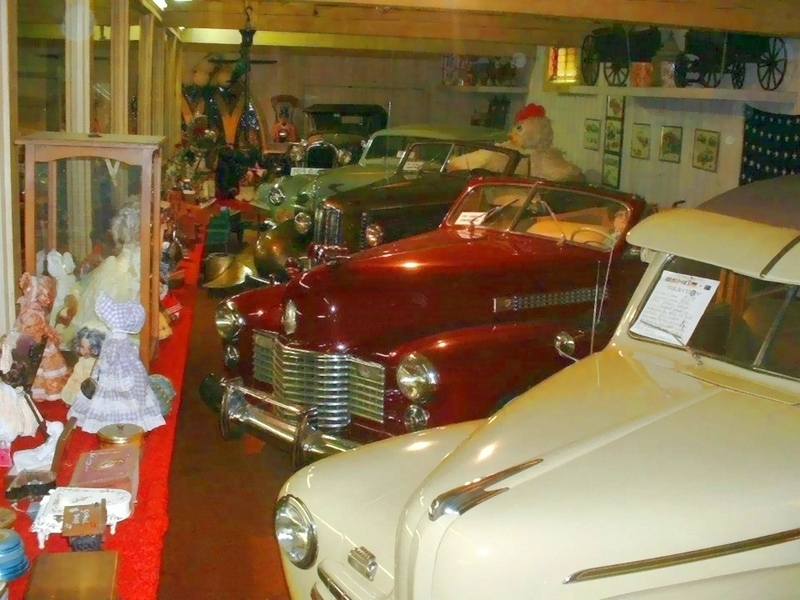 It also features a side room and gallery that includes an antique car collection, other antiques, and Jack Peabody's collection of original Currier & Ives prints, among other nostalgic displays. During the summer, the restaurant has an outdoor petting zoo. 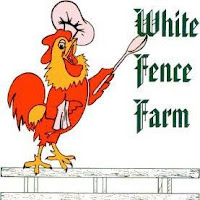 White Fence Farm bills itself as having "the world's greatest fried chicken," which is same-day pressure cooked and then flash fried in soybean oil to crisp the outside. 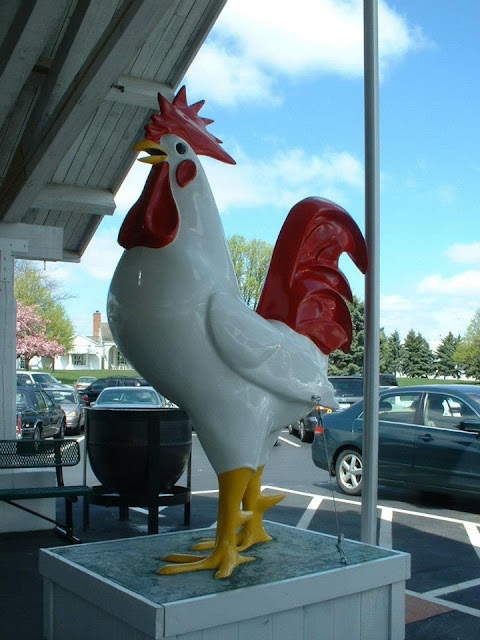 Ever since the Hasterts acquired the restaurant, it has been in near-constant competition with its nearby rival, Dell Rhea's Chicken Basket, for the title of best fried chicken on Route 66 in Illinois and best corn fritters. Once a matter of dueling billboards on Route 66, the competition is now limited to a contest between menu items. 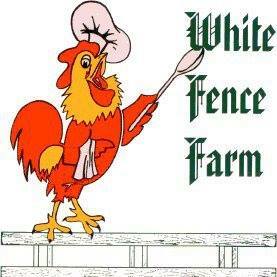 Whereas Dell Rhea's can claim that it began serving its famous fried chicken years before its competitor did, White Fence Farm prides itself in serving an alcoholic brandy ice dessert, made strictly for adults. 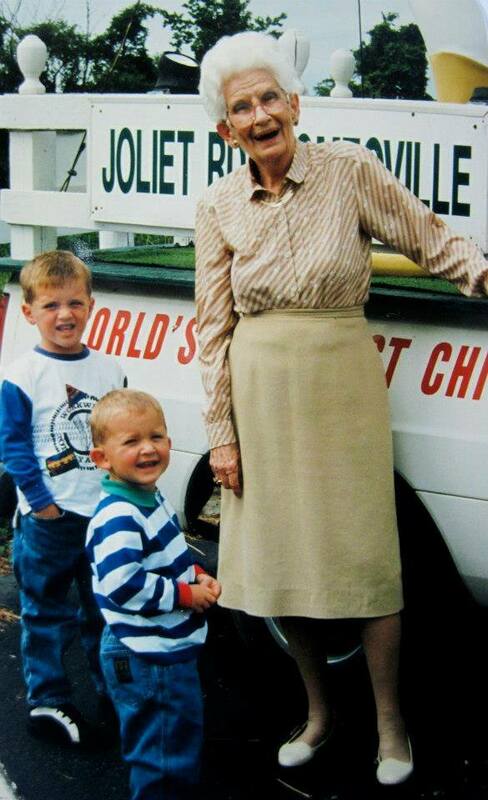 Doris Mae (Hemmingway) Hastert, age 93, passed away Monday, August 14, 2006. Mrs. Hastert was the owner and customer greeter of the White Fence Farm Restaurant 1954. White Fence Farm Celebrates a 60-Year Family Tradition. ROMEOVILLE – Laura Hastert, granddaughter of White Fence Farm founders Robert "Bob" Hastert Sr. and his wife Doris Hastert, recalled how she earned spending cash at age 12 by picking up garbage from the restaurant parking lot with her best friend. Sixty years later, Hastert is still cooking chicken the way her grandparents cooked it – same-day pressure cooking and flash fried in soybean oil to crisp the outside – and treating employees the way they’ve always been treated – as family. 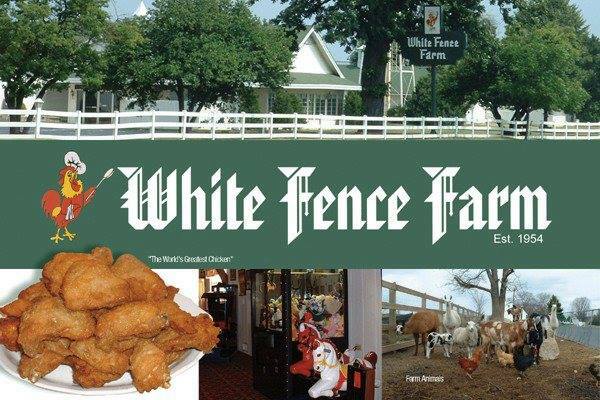 White Fence Farm closes only in January for deep cleaning and repairs, and has just one franchise in Denver. Indeed, the business feels like family. Larry Bigger, 40 years and now general manager, started as a busboy. Hostess Shirley Bigger started as a waitress 30 years ago and met her husband on the job. All three of their children have also worked at the restaurant. Mary Callaghan, 42 years, is a training hostess. Chuck Ker, 36 years, is the day and receiving manager. His wife, Roxanne, also works at White Fence Farm, as have all three of their children. Hugh Moarn, 40 years, is the kitchen manager. Diane Kelly, 34 years, is still waitressing. Bev Svobda, 30-plus years, works multiple jobs: payroll, human resources and office and purchasing. Even Hastert herself, who has a degree in hotel restaurant management from the University of Denver, and formerly worked at Taco Bell for Pepsi Co. and then Rubio's restaurants in San Diego, eventually returned to help run White Fence Farm. And yes, all three of Hastert's children also work at the restaurant. “June Hoffer, our office manager, just passed away a year ago in April. She was here the longest,” Hastert said. “She did all the purchasing and had done the purchasing and the books with Bob at Harmony House. He brought her over here after he bought White Fence Farm in 1953. Not many places have this history and tradition." White Fence Farm was not Bob and Doris' first restaurant. They had founded another, Harmony House in Aurora, and were already cooking what would one day be their famous chicken when they stumbled upon a farmhouse on Route 66. Bob, Hastert said, made an offer, bought the house, brought his Harmony House chicken with him and kept his menu simple. The main entrees have always been chicken, shrimp, fish (Icelandic cod, broiled or fried) and steak, Hastert said. Bob always resisted trends, despite urgings from others. “He used to say, ‘You’ll be the dog chasing its tail’ because fads always change,” Hastert said. A machine dusts the chicken with pastry flour – no egg, no milk and very little salt, Hastert said. The chicken is pressure cooked for 12 minutes, loaded onto carts and then wheeled into a cool-down room to wait for dinner orders and flash frying. The powdered sugar-dusted corn fritters are real corn fritters, not hush puppies. Hastert additions include two “boil in the bag” soups – chicken noodle and cream of broccoli and cheese – gourmet macaroni and cheese, and a dinner salad that's more than the wedge of iceberg lettuce of former years. "Bob would just die," Hastert said.